After receiving his Ph.D. (Dr. rer. nat.) from the Aachen University of Technology (RWTH) in 1998, Rolf Erdmann worked in the Mission Operations Directorate at NASA’s Johnson Space Center in Houston. He spent 11 years working for the United Space Alliance as a NASA-certified EVA Systems Engineer, EVA Flight Controller, EVA Crew Instructor, and EVA Liaison to Russia from 2000 to 2011. Erdmann was also the head of NASA’s EVA Houston Support Group from 2007 through 2011, coordinating spacewalks between NASA, Russia, and other international partners on the International Space Station (ISS). His wide-ranging skill set (and fluency in Russian) saw him working on console in Mission Control in both Houston and Korolev, Russia. He is currently Head of Mission Operations for PTScientists in Germany, and a clinical assistant professor at the University of Texas Medical Branch. In the 1990s, Erdman was selected from 10,000 applicants to train as a cosmonaut candidate in Star City, for a flight to the MIR Space Station (however these plans were foiled by the collision of a Russian resupply ship Progress with MIR in 1997). 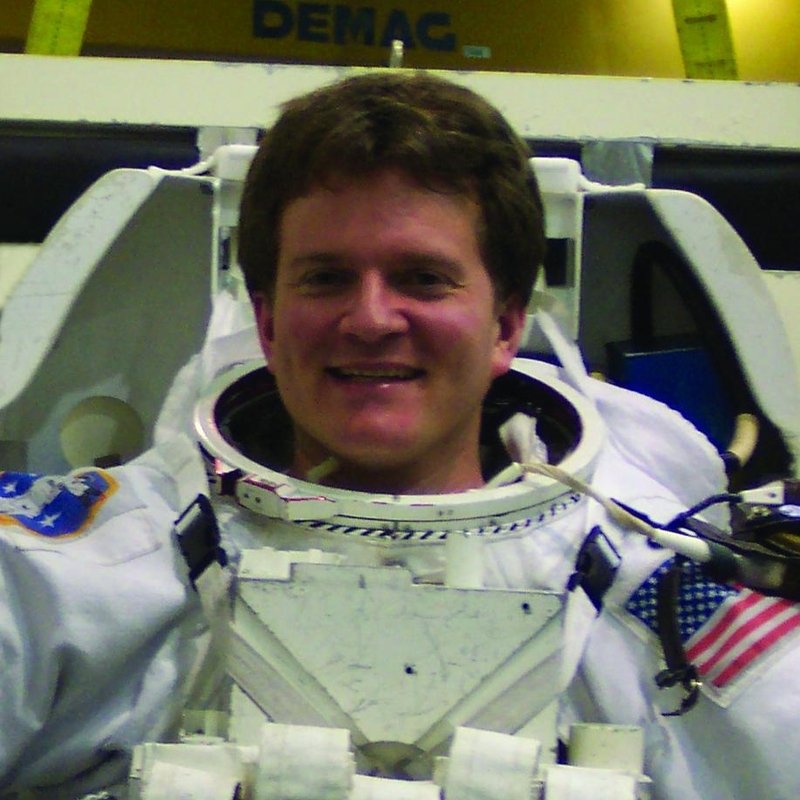 Erdmann later passed the tough interview process and medical testing to land on the shortlist for NASA’s astronaut selection program in 2004. Erdmann is a passionate explorer himself, and a licensed scuba diver and private pilot, having logged hundreds of hours in the air flying everything from taildraggers to high performance jet aircraft. His deep love of science is combined with a spirit of adventure; Erdmann brings a wealth of experience in astronaut selection, crew training, and human exploration, with a vision of one day supporting commercial customers and space agencies on return missions to the Moon. What first inspired you about outer space? What were your personal goals, and has that changed from when you originally began working in this field, to the present day? For me, space is a never-ending story to be fascinated by and educated about. My first space mission was the Space Shuttle Mission STS-55 / D-2 in 1992. Out of the 88 experiments onboard this Spacelab Mission, one of them became my Master’s thesis; the diversity and importance of material science, fluid dynamics, robotics, biological and human physiology experiments thrilled me. That first mission, my goals were to get solid space experience, good grades, and a degree in something meaningful that allowed me to enter the space program in a flexible way that was full of passion, yet pragmatic. From this experience, I knew working in this field was going to be a very intense, lifelong commitment for me. Few people have worked behind-the-scenes at the Johnson Space Center, let alone as an EVA (Extravehicular Activity) Controller, EVA Houston support group lead, and liaison for NASA to other space agencies. What was the experience like to work in this capacity? It’s an incredible privilege to work on these “hot spot” jobs in the space program. I joined the EVA Group at the Johnson Space Center in 2000; alongside the Space Shuttle Program, there was an International Space Station to be built in a so-called “wall of EVAs,” then in 2004, an additional Exploration Program was leveraged upon us too. So now my group was working three massive programs in parallel, instead of just one from a few years prior. And the complexity of EVA had multiplied in different ways. You had to become a crew instructor training both astronauts and cosmonauts; then become an EVA Systems expert and flight controller, learning and continuously improving completely different EVA systems; then coordinate between the space agencies and their various collaborating organizations or companies. Next to the numerous technical aspects of the job, my personal specialty has always been international cooperation by upbringing, abilities, personal beliefs, and passion. Logically, NASA sent me to work on international projects and I was on rotation out of country often, usually for two to four months at a time. It was incredibly challenging and had a steep learning curve but it was a literal out-of-world experience beyond description. What are some of your favorite memories working in this field? Helping to train astronauts, going on spacewalks, or being involved with preflight programs? Wow! Where to begin? I believe I worked approximately 17 Space Shuttle Missions, 30 ISS Expeditions, and about 100 EVAs in a higher or lesser involvement while at the Johnson Space Center. Depending on anyone’s given position, experience level, and assignment, it can be a varying amount of time working on any particular project. Working at NASA can also be a rollercoaster with hefty ups and downs for the teams. Professionally, there are victories and losses no matter how good you are. Emotionally, there have been countless, unbelievable experiences that brought tears of joy to my eyes. But also hardships--losing a space shuttle and her entire crew during the STS-107 Columbia accident and the fallout to follow is certainly a collective memory that everyone who remembers it shares. As someone who coordinates between the United States and Russia, do you encounter a culture clash when working between these two countries? Or does the focus on space travel create a universal language or culture? There’s a culture clash for sure, not only between the United States and Russia, but between many other countries too. We have a saying: “Same orbit, different worlds.” The focus on space travel does help keep us connected. International collaboration in space is important to add capabilities and also to help us realize we’re all in this together during our limited lifetimes as Spaceship Earth orbits the sun. Too often, us Earth land-dwellers often focus on our differences instead of our similarities. This radically changes once we put humans into orbit or onto a different celestial body; then the focus becomes what all of us have in common. Spaceflight is unifying! It shifts the focus from perceived borders and mental barriers. What’s the importance of a moonbase? Is this our logical next step when thinking about future space travel? There’s no doubt several habitats, some long-term and short term or just flown as sortie-missions, will be established in time. The question is when and what are the next logical steps towards getting there. And there are many smart approaches. The current next steps involve continuing to develop our capabilities in international collaborations. Some in traditional agreements with or between space agencies. We’ve entered a new era of human exploration and human settlement, opening markets and providing opportunities previously unthought of. Some developments will occur slower, but others will unfold much faster than we could’ve ever imagined. Look back just 20 or 30 years in your own life: virtually no one could’ve predicted the technological environment we find in our lives today. I believe the same will ring true for the Moon.